The Garden Vegetable Can provides a missing link in your food storage plan. Each #10 can contains 16 popular varieties that will plant nearly 3/4 acre of garden! • Packaged for long-term storage. Will keep up to 4 years if stored at 66–70 degrees and much longer if kept colder. • Harvested seeds can be planted year after year. • Packets are re-sealable for lasting protection. 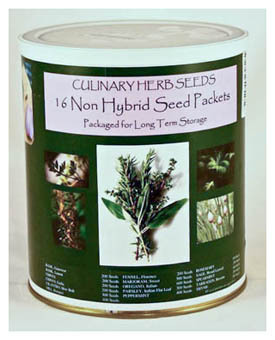 The Culinary Herbs Can is the perfect complement to the Garden Seeds Kit. Each #10 can contains 16 popular culinary herb varieties that will produce enough herbs to spice up your food storage meals in hard times! These Seeds are Non-Hybrid, Non-GMO and are not chemically treated. This ensures that they can be harvested at the end of the growing season and then used for the next year's planting. The Medicinal Herbs Can has been designed to help people meet their health needs in hard times when the family garden may well become our only resource for home remedies. 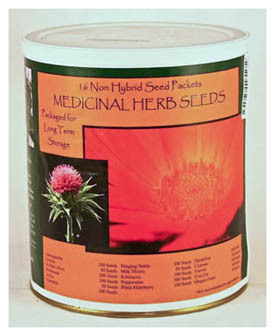 Each #10 can contains 16 medicinal herb seed varieties that have been packaged for long-term storage. The “Fruit ‘N Such” Can provides a vital component to your food storage plan. 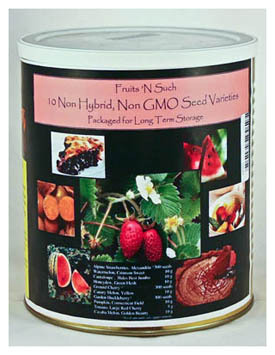 Each #10 can contains 10 garden fruit and vegetable varieties. While storing grains and legumes is important, these fruit varieties offer an opportunity to store some of the comfort foods. Think how delicious a pumpkin pie—or fresh watermelon or ripe strawberries—would taste in times of stress. How about a little huckleberry jam to go on some of that delicious whole wheat bread. These wonderful fruits and vegetables will make hard times so much more bearable! 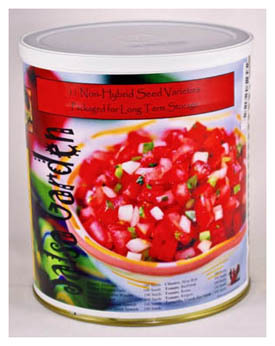 • Contains enough seed to plant more melon, berries, pumpkin etc. than your family could possibly eat in a season with still enough left over to can your own jams and jellies. • Packaged for long-term storage. Will keep up to 4 years if stored at 66–70 degrees and much longer at colder temperatures. The Salsa Can provides a missing link in your food storage plan. Each #10 can contains four types of tomato seed, two onion, one cilantro, one green pepper, one red pepper, one Anaheim, and one Jalapeño pepper. In hard times, wouldn’t it be nice to have more in storage than just wheat, beans and rice? By storing away enough seed to plant a large salsa garden, you will be able to spice up your food storage for years to come. • AWARD-WINNING FRESH SALSA RECIPE INCLUDED!!! The Ancient Grains Can provides 10 grain seed varieties that have been chosen for their proven health benefits and potential for sustainable farming. Through the ages, various civilizations have used these grain crops to sustain, nourish and clothe their peoples. 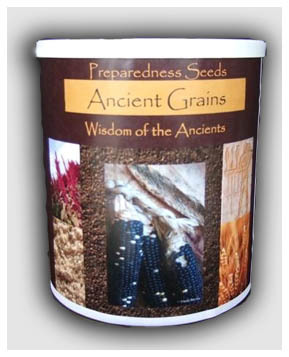 There is no way to include enough grain in this assortment to plant a full crop of any one grain, but the intention is that these varieties of grain may be saved and preserved and then used to build up seed stocks in the event of a time of need. *Important—Because of the shortage of Non-Hybrid seed, substitutions may occur! There are some non-hybrid seed companies that make claims that the seeds will store for 20–100 years, but this is only under optimal conditions with a decreased fertility rate over time. 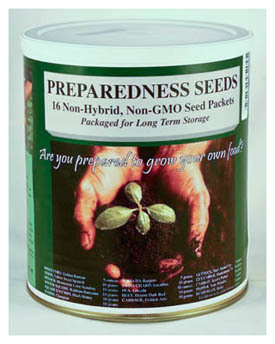 Preparedness Seeds claims that their seeds will keep AT LEAST 4–5 years on a shelf at 70 degrees and much longer if kept refrigerated or frozen.